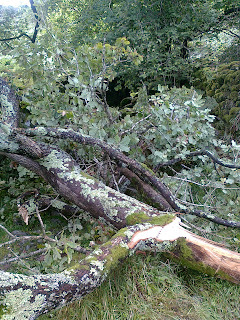 The Lakes suffered some quite strong winds a few weeks ago causing many branches to fall over paths. 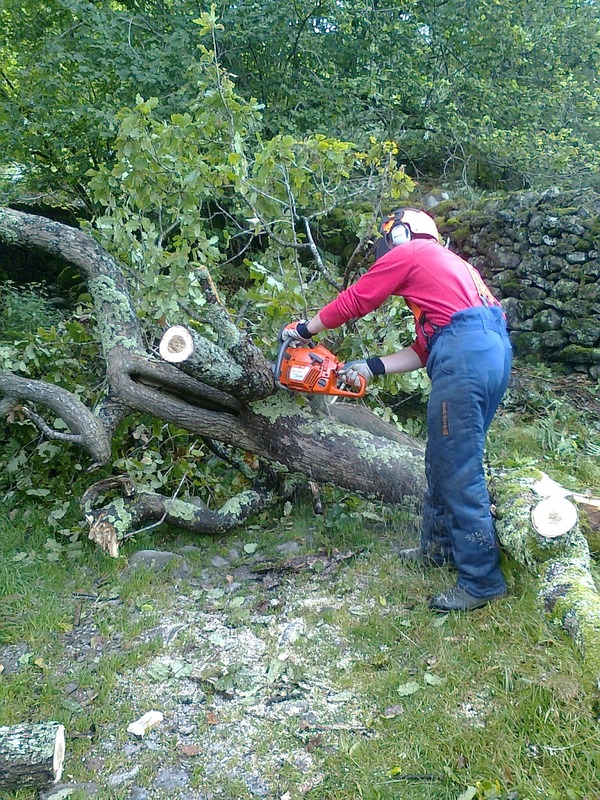 Part of our work is to keep paths clear and safe for our visitors. 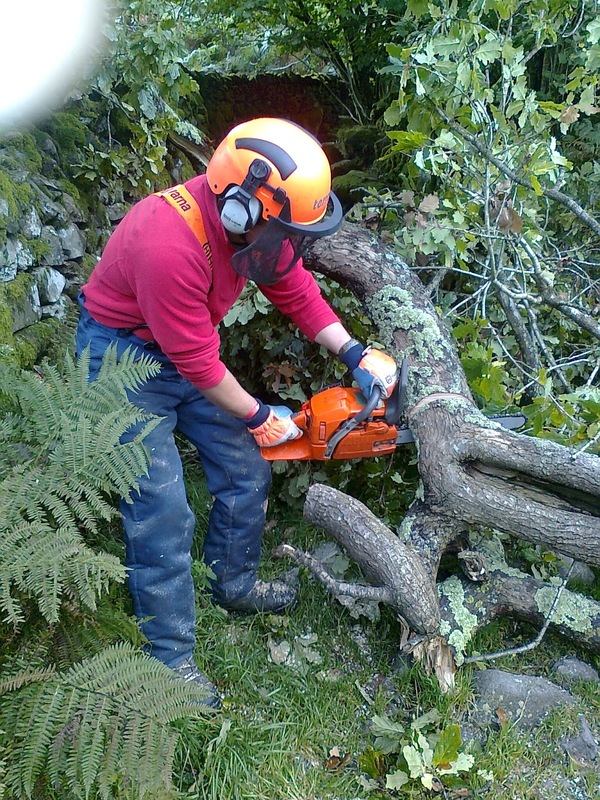 Many National Trust Rangers are trained in the use of Chainsaws to undertake small tree felling and cross cutting, any larger or more dangerous tasks are carried out by our own forestry teams. This oak branch had split from its main trunk and came down over the path leading to Silver How in Grasmere. 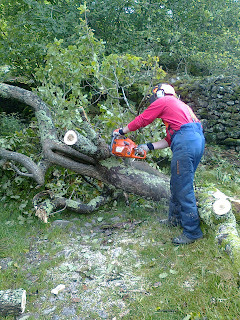 Using the Chainsaw to clear away the small branches first, so access to the larger limbs are made easier to cross cut. Cross cutting the final limb to open up the path. 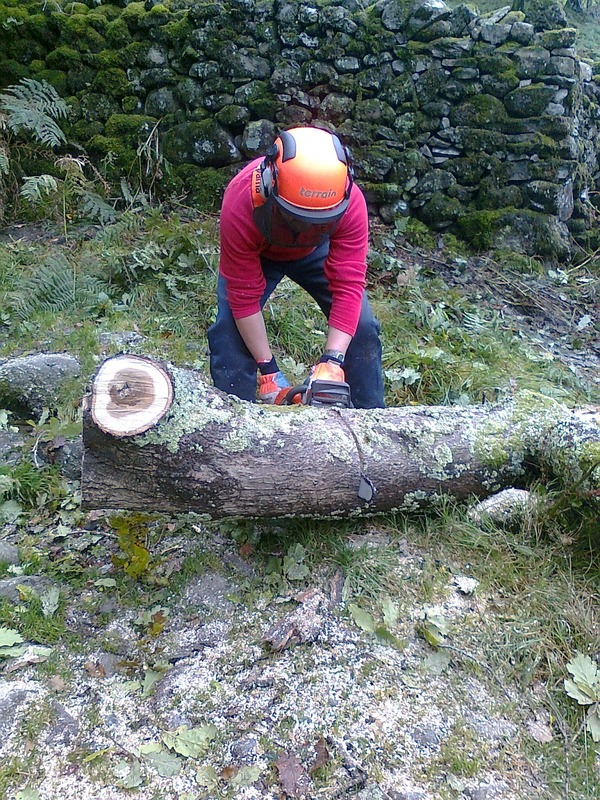 Today we have been installing a new oak gate at the start of the Elterwater path. This gate has been made by the Trusts own Joiners using money donated to someones memory. We start by removing the old gate system and digging the holes for the hanging posts and closing posts. These have to be deep enough to hold the weight of a oak gate. We use the arm of the digger to gently pull out the old gate stoop (cheating) while being careful not to damage the beck wall. The Elterwater path is one of the most popular with lots of visitors enjoying the walk from Elterwater to Slelwith Bridge everyday. A designated bridlepath, Its a beautiful walk for all ages and disabilities, talking in some fantastic views of the Langdales and Elterwater. At the Skelwith end of the path stop to look at Skelwith force and the spectacular Woodburn Bridge. Erected in 2006 and named after a Skelwith Parish Council chairman, its location is amazing. Chester's Cafe is nice sight for many. We have to make the path stock proof, Herdwick sheep could easily jump over the section of beck wall by the side of the gate. We use oak rails to match the gate to create a small post and rail fence to keep stock from getting on to the path. Job finished and ready to be enjoyed by many. The path is prone to flooding with damage still visible from the floods of 2009, we hope to secure funding for repairs very soon.